A total of 19 operators are set to benefit from the Ultra-Low Emission Bus (ULEB) Scheme, Buses Minister Nusrat Ghani announced at the UK Bus Summit on 6 February. £33.8m will assist with the purchase of 263 ultra-low emission buses, while the remaining £14.2m will be invested in charging infrastructure for electric vehicles. As a result of the funding, provided by the Office for Low Emission Vehicles, the UK’s ultra-low emission bus fleet will double in size. “Buses are far more than a way of getting from A to B,” said the Minister. “They are a crucial tool in the fight against loneliness and it is good to see the industry taking steps to tackle isolation. The winning bidders announced at the UK Bus Summit are on the following page. Brighton & Hove Buses is the only operator listed to opt for hydrogen buses. The 20 single-deckers it plans to order (details of which are yet to be confirmed) would run on Metrobus Fastway routes 10 and 20, a 24-hour service with high frequency links between Gatwick Airport and Manor Royal Business District and Crawley town centre, Horley and residential suburbs. The operator also intends to retire the last of its Euro III buses when the hydrogen vehicles arrive. Stagecoach is set to receive 48 vehicles as a result of the funding – the most of any private operator. On top of the £6.9m it has received from the Office for Low Emission Vehicles, Stagecoach Manchester will invest a further £9.6m to add 32 BYD-ADL Enviro400EV Citys to its fleet, along with the required charging infrastructure. The first of the double-deckers are expected to go into service this autumn at the operator’s Sharston depot, replacing Euro III and IV vehicles. The entire electric fleet is expected to be fully operational by the end of 2020. Euro III vehicles will also be replaced by electrics at Stagecoach’s Caerphilly depot – this time a combination of 16 Optare MetroCitys and Solos. The LowCVP welcomed the funding announcement. The standards for the ULEB scheme were initially set out by the organisation – part of a decade-long partnership between the LowCVP, the Government and the industry. Managing Director, Andy Eastlake, said: “The bus sector is showing the rest of the UK’s road transport sector the way when it comes to cutting pollution and emissions which cause climate change. The new funding will encourage the introduction of more vehicles with greater zero emissions range capability and even bigger benefits to both urban air quality and climate change. “Buses are rightfully a key target for policy and support as they are often chosen to operate in areas with the greatest air quality challenges. 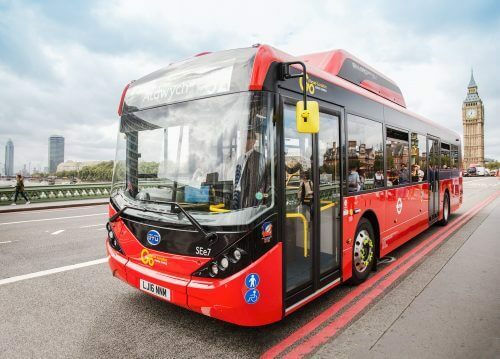 They provide a vital option for local authorities and operators now struggling to meet urgent air quality targets (such as London’s Ultra-Low Emission Zone and Clean Air Zones in other cities). 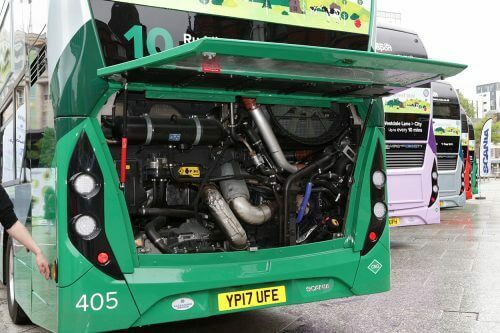 Nottingham City Transport is investing its share of the cash in additional infrastructure for its biogas fleet, and plans to invest in another 67 Enviro400CBG Citys by the end of 2019. Finally, Go-Ahead Group is set to become the UK’s largest operator of electric buses following the announcement. Across all of its companies, the group will benefit from a further 30 battery-powered vehicles, bringing the total number operated across the group to 79. 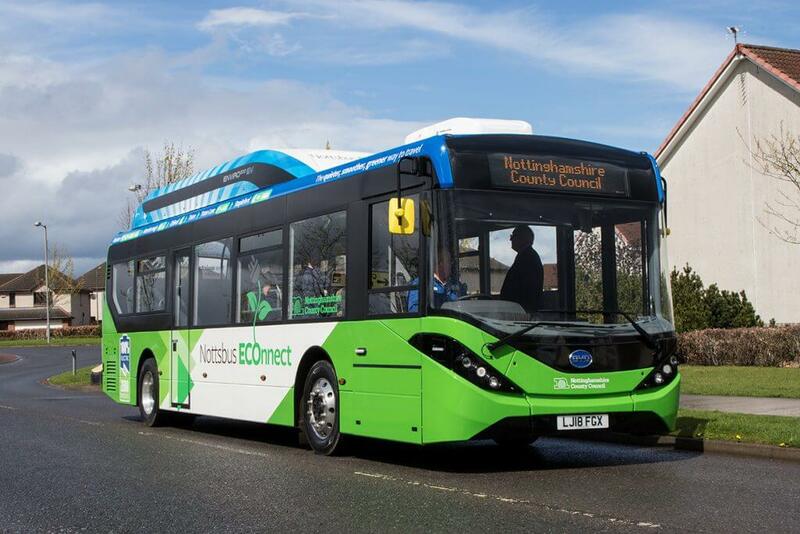 Go-Ahead Group CEO David Brown said: “New technologies such as electric buses are the future of the bus industry.